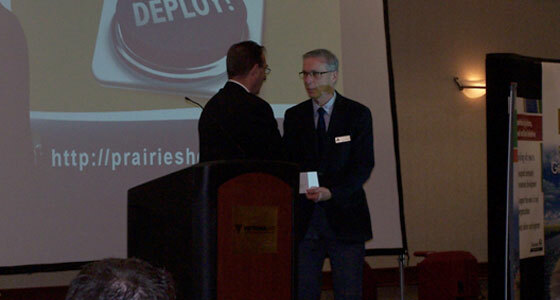 Manitoba’s Minister of Agriculture, Food and Rural Initiatives Ron Kostyshyn presented a cheque to Dr. Dean Care, VP of Academic and Provost, Brandon University for $100,000 at Ranchers Forum on Tuesday, November 27, 2012. This is the second installment under the five-year applied research funding agreement. The Minister noted that Rural Development Institute (RDI) continues to play an important role in Manitoba and beyond in building understanding of key issues and strategies relevant to the economic development of rural areas. Looking forward both Manitoba Agriculture, Food and Rural Initiatives and Brandon University look forward to continuing with research from RDI that addresses opportunities and issues facing rural Manitoba.